Renowned Maine artist Dahlov Ipcar will be signing books to celebrate the Islandport Press’ reprinting of The Little Fisherman, which she illustrated, from 10 a.m. until noon Thursday, Oct. 23, at the Bates College Museum of Art, 75 Russell St.
Beth Almquist of the children’s services department at the Lewiston Public Library will read from Ipcar’s books throughout the session. The event is open to the public at no cost. For more information, please call 207-786-6158. The 90-year-old Ipcar, of Georgetown, is an author, book illustrator and fine artist who focuses on animal imagery. Her delicate illustration work is known worldwide, and her art is represented in the permanent collections of such museums as the Metropolitan Museum of Art and the Whitney Museum of American Art. Maine kindergartners and their parents may be well-acquainted with her work. This fall, the “Read With ME” program created by the statewide literacy organization Maine Reads is giving every kindergartner in the state a book bag containing this year’s featured book, The Cat at Night, written and illustrated by Ipcar in 1969. Some 18,000 kindergartners will once again have the opportunity to read this cherished book, back in print after more than 30 years. Written by Margaret Wise Brown and first published in 1945, The Little Fisherman was the first children’s book Ipcar illustrated, and helped establish the artist in the world of children’s literature. Ipcar was born in Vermont and raised in Greenwich Village, and summered in Maine throughout her life. At 18, she married Adoph Ipcar and left the city in 1937 to live on the family farm on Georgetown Island, where they first met. 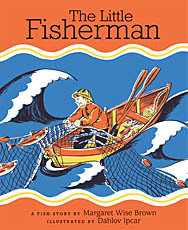 In the early 1940s, though she had grown discouraged with writing and illustrating books, Ipcar agreed to illustrate The Little Fisherman for a New York publisher. The book’s success led to her writing and illustrating more than 30 children’s books over four decades.